I haven't had time to go thru the papers I liked and didn't like yet, but I have been musing on some other aspects of Infovis that I thought I'd recap. To situate this, I usually go every other year to Infovis, and have been doing so since mid-2000's, I guess. Who Went, Who Didn't; Design vs. "Science"
Again, this said, Amanda Cox's brilliant capstone talk, which was largely about design process and decisions at the NYT, was a huge success. As was Jessica Hullman's talk on visual engagement methods (or "chart junk, the sequel," as someone noted--Jerome Cukier, possibly). I know some members of the program committee are trying to figure out how to get more industrial attendance. CHI has been through this for years, and added various case study tracks, panels dedicated to industrial talks, alt.chi for less mainstream academic works, among other strategies. Infovis could use some of this, but attracting people who have successful careers already, and convincing them there is value in attending given the pricetag, needs some more thinking through. I see value for them in the algorithm side of many of the papers -- but that might not be worth the cost of attendance for them. One more contingent: there were a lot of folks from the intelligence communities, DoD, the government in general. My perception is that this has increased. And I think they asked smarter questions this year; they certainly weren't shy about going to the mic. Mike Bostock's D3.js talk was fascinating to those of us who had read his slides from SVG beforehand, but hadn't heard his commentary on them; and if you knew the DataMarket protovis-vs-d3 history online. It was also nerve-wracking worrying about who would ask what afterwards given some of that historical controversy. Apparently not so for other attendees, I heard later! I find Mike's arguments convincing, although I have not tried to build anything sizable in D3 yet. Jo Wood's et al. 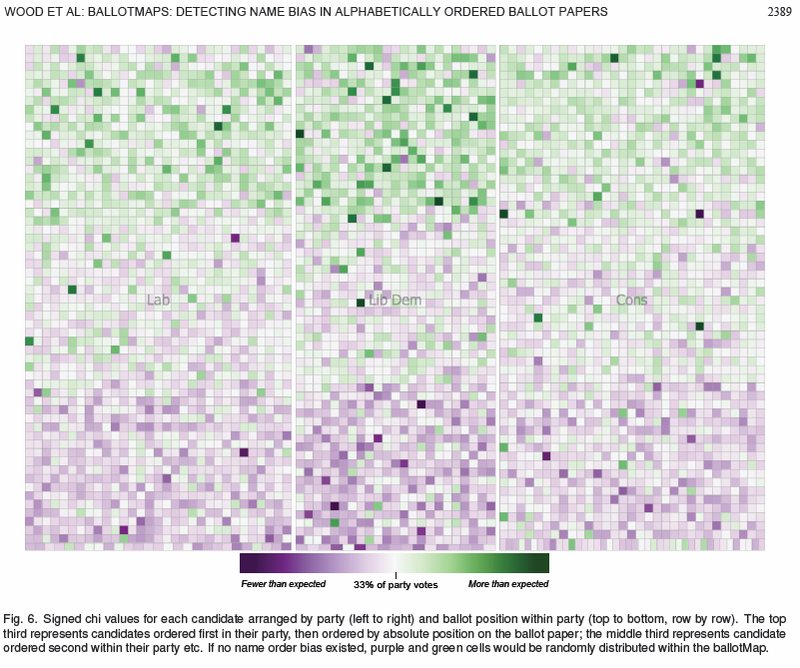 's BallotMaps talk about name-order biases in voting districts was a wonderful "process" talk on using their HIVE system to visually test hypotheses. (For general info, see their org page.) I feel that the talk with demo of stages of visual exploration was important in making the story work, and the paper isn't as easy or fun to grok. Aidan Slingsby et al's talk on showing uncertainty in cluster results was similar (and surprisingly, the paper seems to differ quite a bit in the system design shown). Program Committee: I'd like to see more videos in the proceedings! Student Distractions: To Finish or Not? I definitely had more fun drinking with people who knew a lot about drinks than I have in previous years. They knew about whisky, cocktails, wine, vodka infusions. Beer too. I was humbled by their depth of alcohol knowledge. Doesn't this convince you to come next year? Stanford threw a good party too, to try to improve the conference party scene. Maybe you'll come next year.